Sigh… Though I don’t like to be negative, I have to admit I’ve had a lapse in faith with French Fridays with Dorie this month. When I think back, March did start on a high note with the chicken diable, but the rest of the month has been fallen between ho-hum and downright detestable. It’s been a bit frustrating. 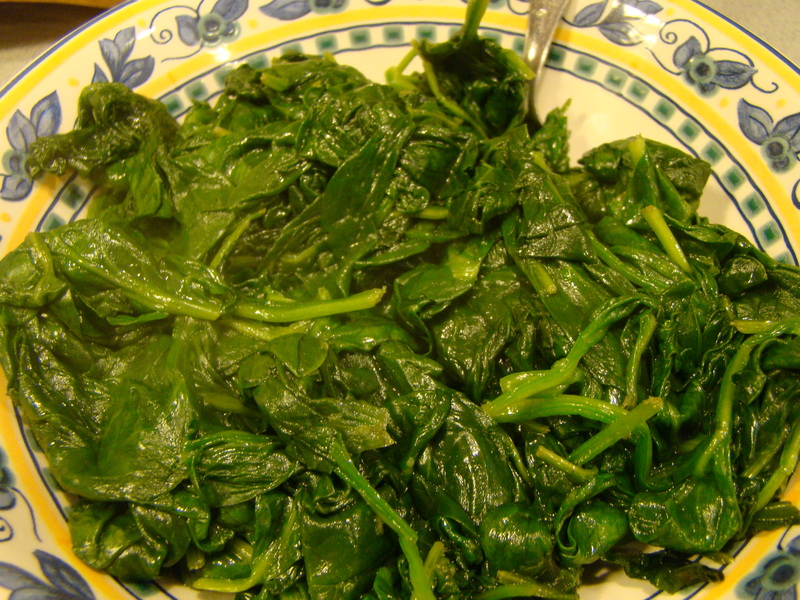 Fortunately, I found the last recipe for March, Lemon-Steamed Spinach, a little more encouraging. This recipe was more of the idea of a technique than a real recipe. You start with baby spinach, and toss it with olive oil, lemon zest, salt and pepper. 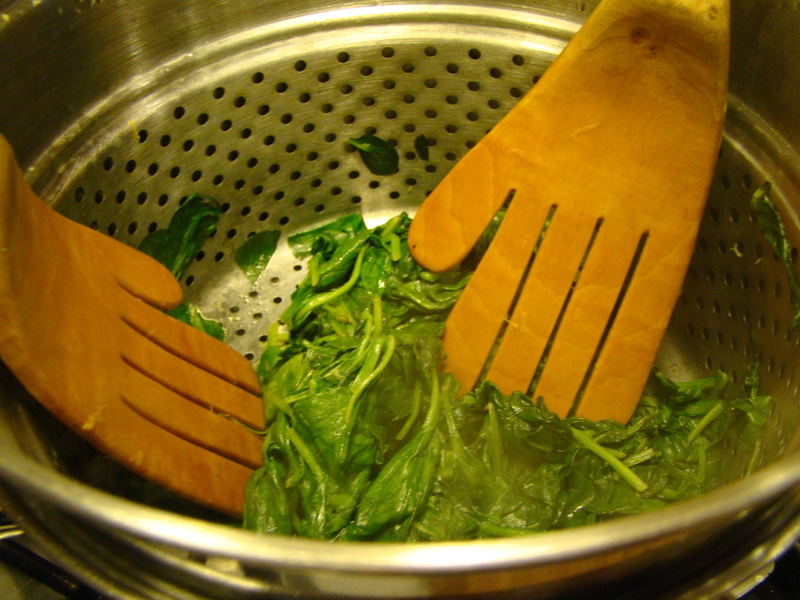 Then, you steam the seasoned spinach until it’s tender. That’s it. I’m always amazed how much spinach shrinks down when you cook it. 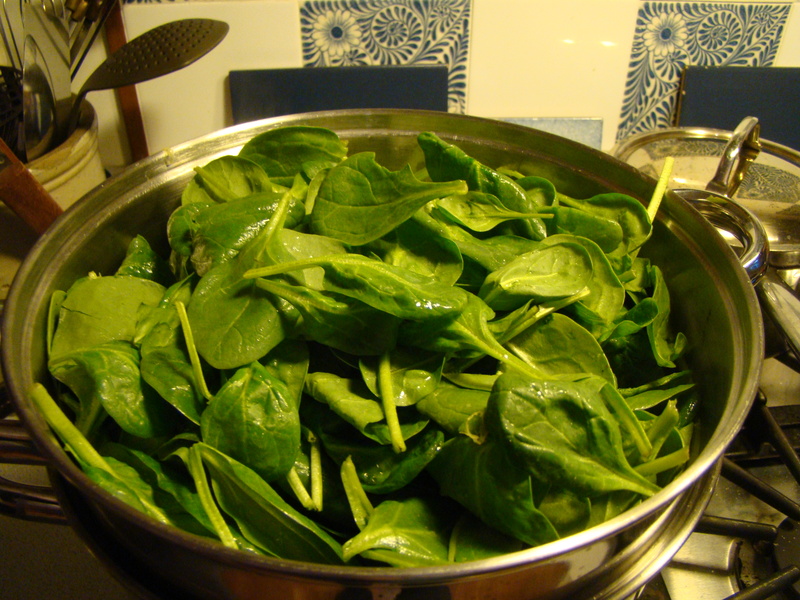 In fact, this recipe starts with A LOT of spinach: 20 ounces. Of course, I knew it would shrink down to just a bowlful, but to start with, it was too much to toss in even my largest bowl. I really should have done the prep work in two batches. Because I have a (seldom used) pot with a (seldom used) pasta insert, I followed Dorie’s suggestion and used it. Again, with this volume of greens, I had to pack it into the pot. Rather than the suggested 3 minutes, it took 9 minutes for the steam to penetrate the green leafy mass and wilt it into tenderness. In the end, the spinach was tasty. I like how it starts out pre-seasoned and is done when it’s done. 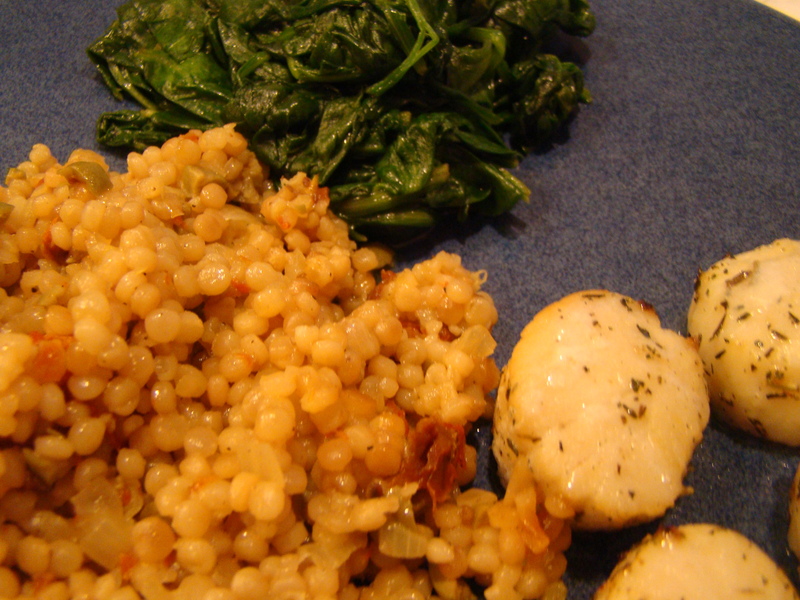 For our dinner, the spinach accompanied roasted sea scallops and Israeli couscous cooked with sun-dried tomatoes and olives. It was a delicious meal! You can find this recipe in Dorie Greenspan’s book Around My French Table. If you want to read other bloggers’ thoughts about this simple spinach preparation, follow their links here. I sure am hoping to enjoy April’s recipes more than March’s.